There is still that fire in the belly and energy to compete and beat the guy next to you … it's a contest, whether it be running or whether it be hunting the football – it doesn't matter. I have that ultimate belief in myself I can outrun anyone. REJECTION at TAC Cup level would extinguish most players' AFL dreams, but Tom Phillips is no ordinary footballer. This is the same second-year Collingwood wingman who speaks ambitiously and unashamedly about wanting to be considered the AFL's best athlete in the coming years. Phillips, the round nine NAB AFL Rising Star nominee, was never lazy or suffered from a motivation shortage. Parts of his game required work as a 16-year-old who failed to make the Eastern Ranges' cut, but more than anything he lacked physical maturation. The genetics were there – his father, Anthony, was on Essendon's rookie list, while his uncle, Andrew, was a 42-gamer at Carlton cruelled by three back operations. Time and second opportunities are not always afforded in the fast-paced football world, but Phillips benefited from both when the Oakleigh Chargers gave him a chance after a year playing for Caulfield Grammar. 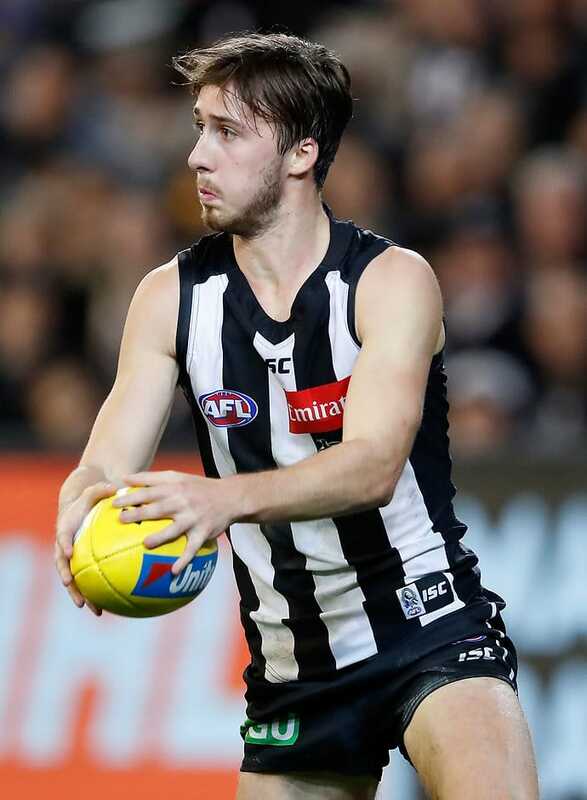 Phillips, like fellow Magpies Tyson Goldsack and Jamie Elliott before him, spent a second year at TAC Cup level as an overage player before Collingwood selected him with the No.58 pick in 2015. "I wasn't too physically developed or ready at that stage, in their opinion, to be what they wanted and it's almost done a service to me," Phillips told AFL.com.au. "It pushed me harder to want to achieve what I always set out to achieve – to play at the top level. "Finally getting the opportunity at Oakleigh was really great for me to be able to showcase my talents … everything that's come towards me I've tried to take with open arms." Phillips' own experience gives him a valuable insight on this year's debate about raising the draft age. "Everyone's different, but I've been more equipped having that extra year of development in my under-19 year through the TAC," the Beverley Hills junior football product said. "There's a very low percentage of players who come straight into the AFL system at 18 and are starting round one or playing a large majority of games in their first year. "It was a great opportunity for me going back to Oakleigh in that under-19 period to restamp my claim and give the recruiters a second look at my ability and performances." Phillips, an aspiring journalist studying communications at Deakin University, collected another 24 disposals in Collingwood's dramatic recovery on Saturday night from 43 points down to beat Hawthorn. It was his fourth 20-plus-possession effort of the season and sixth in his 14-game career. Phillips admits his decision-making can get better and that he rushes on occasion, but that awareness is also what makes him what he is. The 21-year-old is never satisfied with his lot and has designs on being an Isaac Smith-type player who can break lines and churn out hundreds of metres gained with the ball. Phillips won a bronze medal at the national championships in the under-17 2km steeplechase in 2011 and represented Victoria three times in cross-country running. "That nervous energy, adrenaline and anxiety when you're running is not too dissimilar to when you step out in front of 50,000 to 100,000 people on the MCG," he said. "There is still that fire in the belly and energy to compete and beat the guy next to you … it's a contest, whether it be running or whether it be hunting the football – it doesn't matter. "I have that ultimate belief in myself I can outrun anyone."